It’s now a little over two years since I went solo. I’d spent nearly two decades ‘working for the man’ and, frankly, I’d had enough. However, what I hadn’t quite anticipated was how hard I’d have to work at being productive. And that might sound like something of an obvious statement, until you consider how traditional office working tends to pan out. In my previous job, an eight hour day would consist of around four hours of meetings, catching-up with colleagues and random water cooler conversations, leaving just four hours for actual work. Now I’m on my own, an eight hour day is literally eight hours of work. I start work at 6:30ish every single day. And I’m terrible as a human being in the morning. Somehow, though, I’ve discovered that I’m actually pretty productive at that time. That was quite an epiphany, and even though it takes me a while to come around, it turns out that my brain is pretty productive during those early hours. Try it yourself. If you’re not an early bird, it’ll be hard, but you might be as surprised as I was with the results. Sitting around in your hoodie and joggers all day might sound like the perfect way to work, but once the initial novelty wore off for me, I began to feel like I was working on a day off. As a result, my productivity slipped. I now get showered and dressed as early as possible. It sets me up for the day and puts me in ‘work’ mode. A small thing, but it works. Everyone will have their own idea of what the ‘perfect workplace’ is, but for me, it’s the office I’ve created in my converted garage. I have a clean, tidy desk, a smattering of greenery and everything else is very minimalistic. Yours might be different, but the same goes for tools. I have a single computer in there, and the bits and bobs I need for my new found love of pen and paper. Put simply, it’s highly tuned for maximum productivity. Exercise is vitally important when it comes to raising your productivity levels. Ensuring a good flow of oxygen to the brain will keep it ticking over nicely and you’ll make sure you avoid sitting in a chair all day. A brief run, walk around the block or trip to the gym will do it, but make it a daily occurrence. I recently had a meeting cancelled while I was in London. I had two options – either go home and work, or stay in London. I chose the latter – and went shopping. I felt bad initially, but then realised I had every right to do that, and given that I’d worked three very busy days prior, probably needed a break. Don’t worry about taking a day off as a freelancer. Providing it doesn’t get in the way of project delivery dates and your motivation, your body and mind needs it. 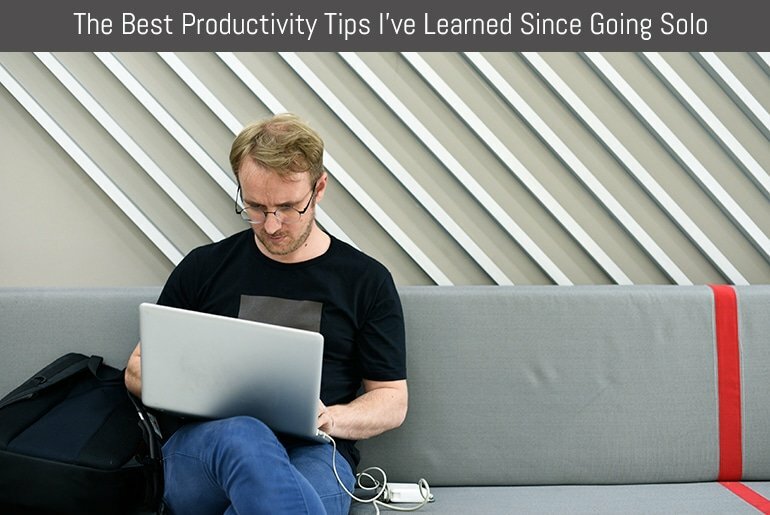 You’ll return fresher, and far more productive. At the start of this post, I noted that you’d need to ‘avoid distractions’, but I’m going to counter that with the fact that, as a freelancer, you are indeed free to do what you want. And, if you feel like watching fifteen minutes of the news when your creativity levels dip – do it. Being a freelancer is all about being kind to yourself. The takeaway today is therefore to avoid punishing yourself if you break away from work to do something you enjoy. As it happens, it’ll help your productivity immeasurably!